This year our youngest RE class (children 3 years to a “young” 6 years of age) chose for its name, the “Manatees.” The Manatees classroom is organized around the curriculum, “Spirit Play.” Through storytelling and structured free-play opportunities, Spirit Play assists children in ways appropriate for their age and developmental level to explore existential questions such as, Where did we come from? What are we doing here? How do we choose to live our lives? After an initial story/lesson demonstrating how people live out UU values and principles, children work at their own pace on activities that reflect their interests. 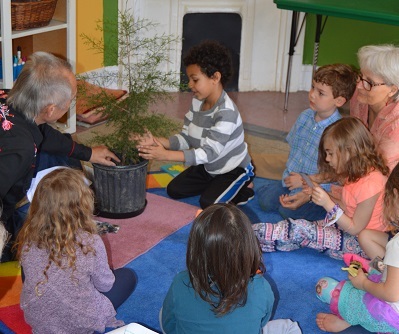 Spirit Play is a Unitarian Universalist adaptation of Jerome Berryman’s “Godly Play,” a curriculum that uses Montessori-based methods of hands-on exploration and questioning. Learn more about the curriculum at http://www.spirit-play.com. Climate Change vs. Love – What Then Must We Do?